Apple's notoriously haphazard approvals policy for App Store games continues unabated. 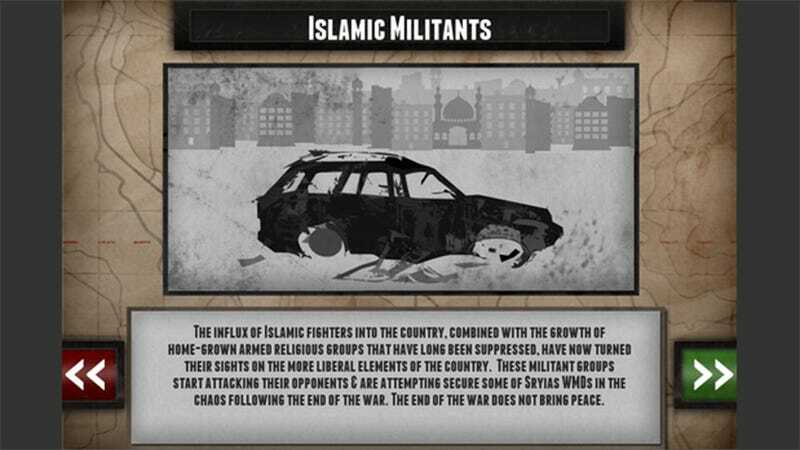 Only a few months after a historical game about the Second World War was blocked for daring to use flags, a serious game about the current conflict in Syria has been barred for much the same reason. Pocket Tactics discovered last night that Auroch Digital's Endgame Syria—part of the Game The News scheme—had been "rejected by Apple's approvals team for violating guidelines section 15.3", which forbids titles from "solely target[ing] a specific race, culture, a real government or corporation, or any other real entity". In other words, Apple's approvals and app guideline process forbids the most basic form of political expression and commentary. It'd be hilariously absurd if the joke hadn't worn off long ago.